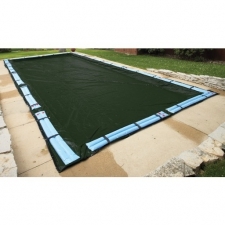 Rugged polyethylene scrim and coating means that this cover can withstand winters worst. Arctic Armor covers are U.V. protected so they will last for years in direct sunlight. The cover's black underside retards algae growth and heat sealed seams means a crystal clear pool next spring. Our covers come with loops every four feet to secure water bags and corner grommets allow for extra tie down in windy areas. 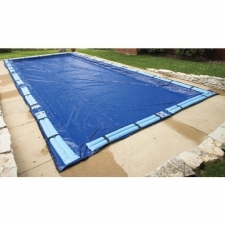 The cover is 5 feet longer and wider than the pool size.